The largest survey of its kind looking at public attitudes towards infrastructure across 28 countries worldwide released by the Global Infrastructure Index 2018 has ranked water and sewerage services as 2nd highest in terms of satisfaction out of 10 sectors, while flood defences is ranked lowest. The report provides rankings at both overall global level and the G8 group, together with individual rankings for each of the 29 countries. At a global level, of the 10 sectors, airports rated most positively (67%) followed by digital communication infrastructure (54%) and water supply and sewerage (52%). In comparison, flood defences at 58% had the highest levels of dissatisfaction, with only 28% of people polled rating flood infrastructure provision as good/ fairly good. While 73% said that infrastructure was vital to their country’s future economic growth, 59% of people surveyed said their country wasn’t doing enough to meet future infrastructure requirements, re-enforcing the need for governments, regulators and investors to work together in the delivery of sustainable and innovative infrastructure for future generations. At a global level, the current quality water and sewerage services provision ranked as good or fairly good was 52%. For the G8, 57% rated current quality at 57%– but this is down from 60% in 2016 and 2017 respectively. In the individual country rankings, Germany ranked top out of the 29 countries with 75%, followed by the Czech Republic at 73% and Saudi Arabia at 70%. The USA was well down the list in 17th position on 51%. Romania came in at the bottom on 25%, followed by Italy on 29% and Mexico on 30%. In terms of which types of infrastructure should be made a priority for investment out of the 10 sectors, water and sewerage services were ranked at 43% and 33% respectively for global and G8 countries – second only by a small 2 point margin to local road networks on 45% and 46%. Flood defences came in at 4th position – 41% at global level and 35% in the G8 respectively. Currently only 28% of the quality of flood defences globally are ranked as good/fairly good, compared with 58% ranked as poor/fairly poor – among the G8 the figures are 30 and 49% respectively. 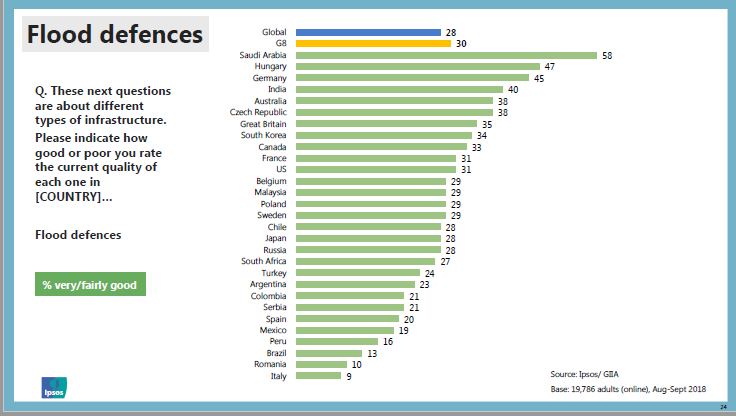 In terms of individual countries – satisfaction with flood defence infrastructure provision in Saudi Arabia, perhaps unsurprisingly, came top at 58% compared to global and G8 ratings of 28% and 30% respectively. Italy and Romania came in low in the rankings, with Italy ranked bottom on 9%, followed Romania at 10% and Brazil at 13%. Among sectors, airports are the most positively rated with flood defences and nuclear energy rated most negatively. 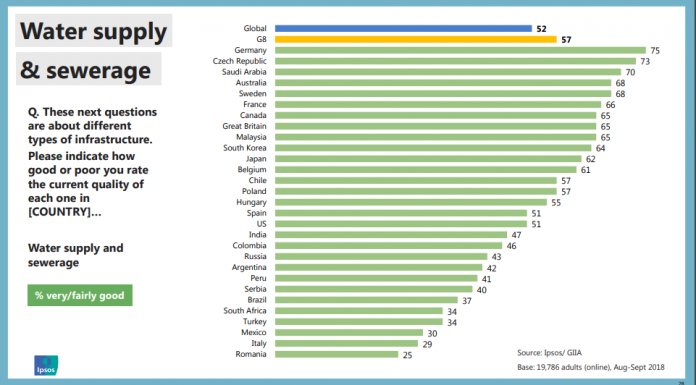 Compared to the global average, publics across the G8 are relatively more positive about rail, flood defences and energy-generation, nuclear and water supply and sewerage. Globally, more people are comfortable with foreign investment in new infrastructure if it means it gets built more quickly than not, by a margin of two and a half to one (49% to 19%). Globally, 61% say not enough is being done to involve the public in infrastructure decisions, with Romania coming top at 78% in terms of whether the country is not doing enough to meet its infrastructure needs.